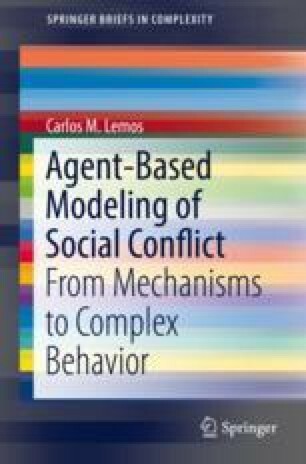 This chapter contains a review of the state of the art on agent-based models for simulation of large-scale social conflict and violence. It is structured in four parts. The first contains a summary of general definitions and concepts. The second contains the presentation and discussion of Epstein’s agent-based model, which is a landmark model of civil and ethnic violence due to its simplicity, soundness, and explanatory power. The third part contains a review of extensions of Epstein’s model that have been proposed by several authors. The chapter ends with some remarks on the limitations of existing ABM and on possibilities for their improvement.